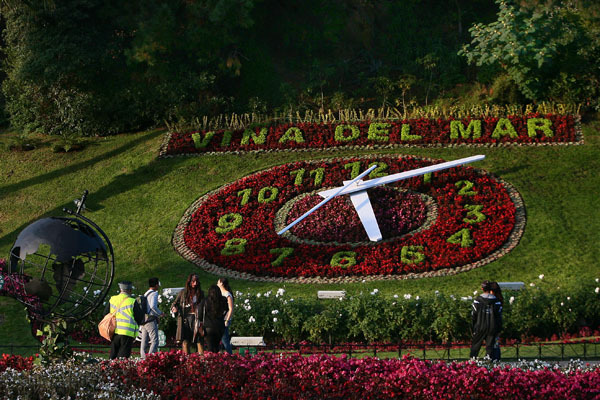 Although its name means "Vineyard of the Sea", Viña del Mar (or simply "Viña for most of Chileans), is traditionally known as "The Garden City". This resort town is located in the central coast, 120 km. West of the capital Santiago and belongs to the Region of Valparaiso. According to the census of 2012 its population reached 312,000 inhabitants, but together with Valparaiso and other neighboring communes make up an area of more than 1,000,000 inhabitants. 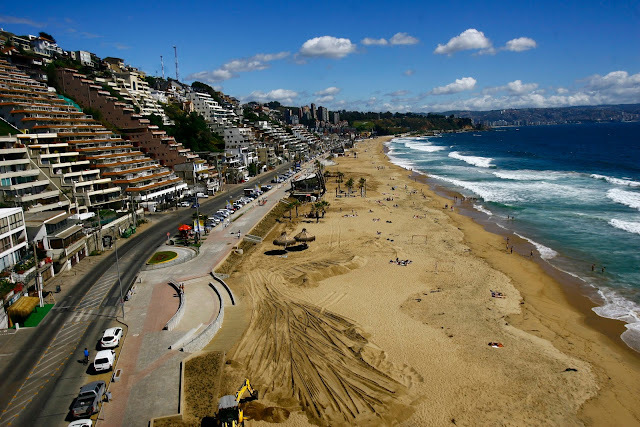 Vina del Mar stands out for its cozy beaches (although now a little bit changed and we'll see why), boulevards, large malls, good hotels and B&Bs, Casino and various entertainment venues. A great event that has made the city famous throughout Latin America and the World is the Festival Internacional de la Cancion (International Song Festival), also known as the Festival de Viña, which since 1959 takes place every year during the month of February. The event is held at the Quinta Vergara, amphitheater with capacity for more than 15 thousand people. Since its inception, a myriad of great artists have performed on its stage, Ray Conniff, Neil Sedaka, Tom Jones, Lionel Richie, Julio Iglesias, Luis Miguel, Sting, Europe, Modern Talking, Miami Sound Machine, Franz Ferdinand, Gustavo Cerati, Kool & the Gang, Jamiroquai, Morrissey, Simply Red, Shakira, Rick Astley and many others. Traditionally, the final day of the Festival de la Cancion de Vina del Mar, marks the end of the holiday season for most of the vacationers, as the date generally coincides with the end of the hottest days of the summer and also the return of students to classes. Currently, climate change, and especially El Niño phenomenon have produced heavy swells along the entire Chilean coastline flooding the plain areas and causing great damage, in this case behind the beaches of Viña del Mar and to the beaches themselves. In parts, there has been serious erosion of the soil reaching even the pavement of the streets. However, this city, its authorities and people that largely lives off tourism, are constantly working to maintain what has always been the cozy infrastructure that surrounds the shoreline, even refilling with sand the beaches that have suffered the greatest damage. For its part, the Chilean Navy has called on the community and visitors to act with prudence and caution, respecting safety regulations, avoiding transit through dangerous areas, not to swim in unauthorized beaches or to practice nautical activities without authorization. 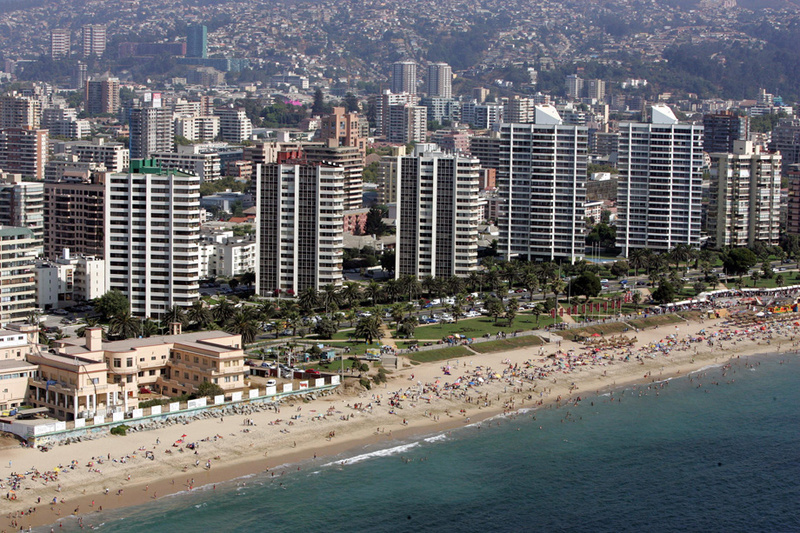 Even so, Viña del Mar is a city noted for its beaches. Among the most important are Playa Reñaca, the epicenter of the summer activity of "Viña", along Borgoño Avenue, northern part of the city, visited by national and foreign tourists. With almost 1.5 km. of beach, Reñaca is one of the most important tourist attractions of Chile, there is a wide variety of hotels and cabins overlooking the sea from a stepped hillside. Next to Reñaca is Playa Las Salinas, small beach protected by rocks which give it a solid refuge against wind, security and privacy. The mild waves make it also ideal for children. As in the whole area, there are a variety of restaurants. One of the most popular beaches of Viña del Mar is Caleta Abarca, the closest to the downtown, of very easy access, next to the beach, the Sheraton Miramar Hotel. Another beach, easily accessible and preferred by many tourists is the Playa Cochoa (Cochoa Beach), northern limit of the commune, surrounded by a lot of cozy restaurants. Playa Cochoa is a quiet place, where its restaurants make it the perfect place if you also want to enjoy a good meal. Playa Acapulco (Acapulco beach), just steps from the city center is located this beach bearing the same name of the famous Mexican resort. Together with Reñaca, ranked one of the most visited of Viña del Mar, with a developed infrastructure, lots of restaurants, shopping centers and hotels in the nearby Avenida San Martin. Playa Blanca, other of the beaches located in the central perimeter of the city, parallel to Avenida Jorge Montt, surrounded by modern buildings and malls. Of generally gentle waves, however whirlpools make it unsuitable for swimming. Besides those already mentioned, other popular beaches of Vina del Mar are Los Marineros, Playa El Sol, Playa Casino. Address: 398, Callao Street. Neo-colonial mansion located at Viña del Mar downtown, (Castillo Hill). It is the resting place of the presidents of Chile and occasionally works as an alternative seat of the Government Palace located in Santiago. It was built between 1929 and 1930 in the place where was situated the old Fort Callao, which once protected the neighboring city of Valparaiso. Open to general public during the Dia del Patrimonio Cultural (Cultural Heritage Day) which is commemorated every year the last Sunday of May. Address: 214, Quillota Street. Museum and former palace of French neoclassical style, housing an exquisite collection of furniture of the early twentieth century. The building is situated in the place where in the past stood the manor houses of "La Viña de la Mar" farm, owned by Jose Francisco Vergara and Mercedes Alvarez, founders of the Garden City. In 1907, after the earthquake that had devastated Valparaiso and Vina del Mar the previous year, Mr. Fernando Rioja Medel, owner of the first tobacco industry in Chile, started the construction of this palace, whose design was commissioned to the French architect Alfredo Azancot. In 1956 the building was acquired by the Municipality of Viña del Mar, which allocated it for cultural events and ceremonies, since 1971 the building functioned as City Hall, and finally, in 1979 the Palacio Rioja was destined for Museum of Decorative Art. In 1985, the residence, together with its surrounding park were declared a National Historical Monument. After the earthquake of historic proportions that struck Central Chile in February 2010 (8.8 magnitude on the Richter scale), the palace suffered structural damage and was closed. In 2014 began its restoration and recovery of works of art, furniture and acquisition of new equipment. The building was reopened on May 13, 2016. The palace gardens have native species such as Araucarias of more than 200 years, there are also hundreds of species from China, Brazil, Australia and Japan. Among the most representative halls of the Museo de Arte Decorativo Palacio Rioja are the Salon Rosado and Salon Celeste, the collection consists of 333 objects of great aesthetic, historical and heritage value that are exhibited permanently in the rooms that once were the residence of the Rioja family. Address: 37, Marina Av. Typical and imposing building, its design stands out from the rest of many other neighboring buildings. Built between 1905 and 1906, its designer was inspired by an old mansion of Liechtenstein, the original owner was Gustavo Adolfo Wulff, prominent German businessman and philanthropist arrived in Chile in 1881. 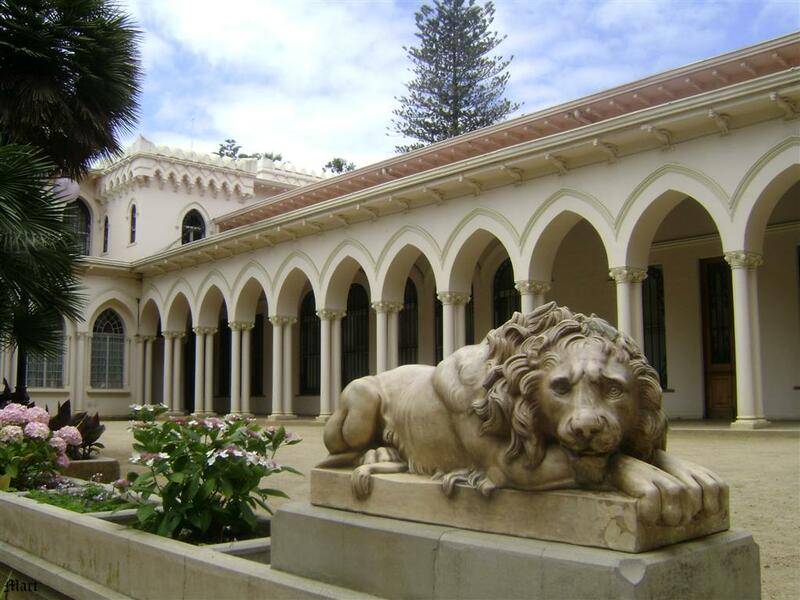 Currently here operate some units of the Municipality of Viña del Mar and in its halls Art Exhibitions are held throughout the year. Note: Damages to Castillo Wulff due to the last heavy swells, have caused temporary closure of this icon of Viña del Mar this 2016 Summer, all activities were suspended for several months. Address: 104 Iberia Street. 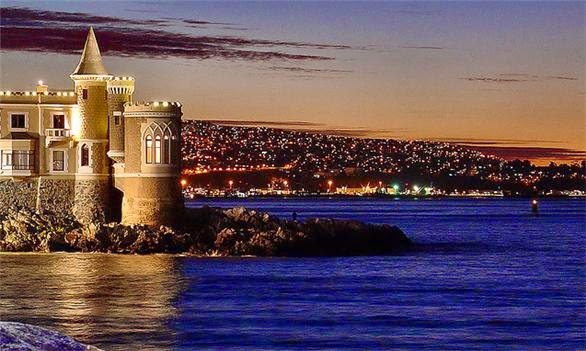 Another construction that gives a distinctive stamp to Viña del Mar is Castillo Brunet, one of several castles that recall a time of economic splendor of the early twentieth century. Work of the renowned architects of the time Alfredo Azancot and Jorge Schroeder, it is located next to Cerro Castillo, overlooking the city center and the northern shore of Estero Marga Marga. The Brunet family began its construction in 1923 but the work did not end until it was sold to businessman Mr. Nicolas Yarur who gave it the current arabesque details. In 1974 the building was transferred to Carabineros de Chile who allocated the castle to their recreational and gastronomic area. Address: 50, Marina Av. Today turned into the Club Union Arabe, is a replica of a nineteenth century Scottish residence, built in 1912 by the renowned architect Alberto Cruz Montt at the request of Gustavo Ross Santa Maria, politician and businessman of the time. Its architecture belongs to the medieval Tudor style, a design born in England during the sixteenth century and whose characteristics are based on sophistication and wealth. Its exterior stonework is outstanding. Inside, the building keeps original furniture and rooms, such as the old desks, bedroom and luxurious bathroom fully built in Carrara marble used by the former owner and his illustrious guests, including the Prince of Wales, who was here in 1925 . Although currently (2016) it is closed to the public for repairs due to the earthquake of 2010, I can not overlook this place that for decades has been one of the emblematic sites of Vina del Mar, located within the natural environment known as Quinta Vergara, south of Estero Marga Marga in the city center. The Quinta Vergara is also famous for being the place where for many years has been carried out the International Song Festival of Viña del Mar. The Vergara Palace was built between 1906 and 1910 as a residence for the family of Jose Francisco Vergara, one of the founders of the garden city. The current building is the third on the site, built on the foundations of the previous constructions, designed by the Italian architect Ettore Petri Santini. Much of the furniture was purchased in Europe, belonging to the Rococo, Louis XVI and Empire styles. The architectural style is predominantly Venetian Neo-Gothic, which can be appreciated in the arches and balustrades of the facade and interior rooms, decorated in plasterwork and covered with golden brocades and tapestries embroidered with gold and silk. The exterior was remodeled with the help of French landscape gardeners, who incorporated statues, busts and designed pools and trails to explore the park and the slopes of the hills. In 1941 the Municipality of Viña del Mar, acquired the gardens and Palacio Vergara, also part of the furniture and collection of European paintings, the park became for public use and the building was destined for Museum and School of Fine Arts. On May 9, 2000 the City Council of Viña del Mar declared the palace Historical Building. The "Museo de Bellas Artes de Viña del Mar" keeps and exhibits about 60 paintings of the Venetian school of the sixteenth century, of the Spanish and Italian school of the seventeenth century and impressionist paintings by Joaquin Sorolla. Meanwhile, the Chilean painting collection has been formed through purchases and valuable donations of renowned residents of the city. Traditional postcard of Viña del Mar, at the foot of Cerro Castillo, in front of Caleta Abarca beach. It was installed in 1962, when the city was one of the venues for the FIFA World Cup held in Chile during that year. The current GPS controlled mechanism, also includes ringing and melodies digitally programmed, changing according to the seasons and important days to celebrate. Address: 305, Camino El Olivar, El Salto. One of the most important green areas of Vina del Mar, located in the area of El Salto, SE of the city, with a total of 395 hectares of native and exotic plants that make it an excellent choice for a walk in the nature. It is also known as "Parque del Salitre" ("Saltpeter Park") given that its creator was Pascual Baburizza, businessman of Croatian origin who, among other activities, devoted to the trade of nitrate industry in the early decades of the 1900s. In fact, of the current area open to the visitors, there are 22 hectares belonging to the former park built by Baburizza in 1918, the National Botanic Garden itself was created in 1951 when the original Parque del Salitre, was donated to the state of Chile. The park contains more than 3,000 plant species of all types, a large number of trees and a palm grove, plus a pool with a pedestrian walkway ending in a trail in the woods.